Overlook of Porto and Rio Douro. Hilly like San Francisco, Porto is the second largest city in Portugal, known for their production of fine Port wine, Francesinha and the world’s third most beautiful bookstore. Oh, and J.K. Rowling spent three years here as an English teacher during the darkest and brightest period of her life. In those first weeks in Portugal I wrote what has become my favorite chapter in the Sorcerer’s Stone, “The Mirror of Erised” – and had hoped that, when I returned from Portugal I would have a finished book under my arm. In fact, I had something even better: my daughter, Jessica. Our flight landed just as the sun was rising at the Porto airport. Though I was sleepy and tired as heck, it was luck in disguise because when we walked out of the Saõ Bento metro station, we saw the city in a soft morning fog that we didn’t get to experience anywhere else during the trip. We stayed at a bed and breakfast like rental apartment a couple of blocks north of the neighborhood Ribeira by Rio Douro. The well-situated apartment was beautiful and massive, with one bedroom, one bath, full kitchen, dining, and living room. There was even a “welcome” bottle of wine! 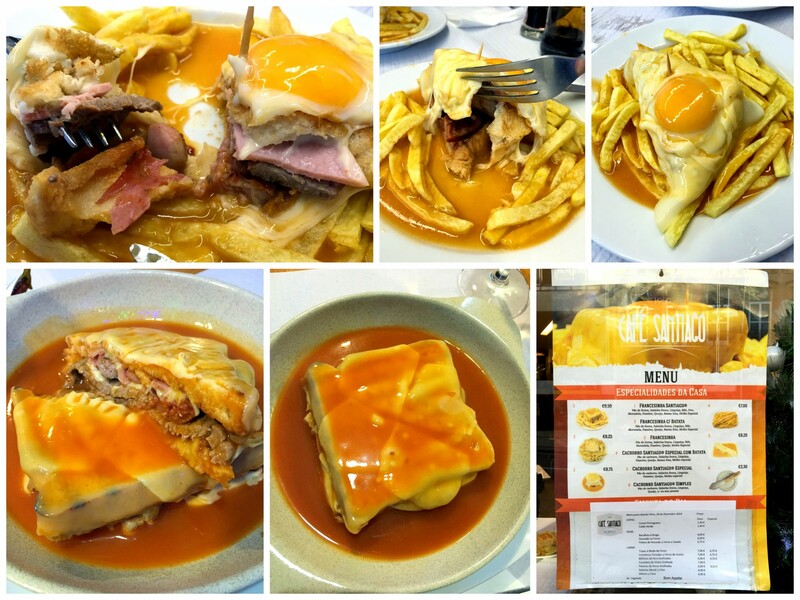 Soon after we settled in we went to look for one of the best Francesinha in town. Francesinha is a specialty sandwich of Porto, made with toast, 4-6 types of meats/filling, covered in melted cheese and drenched in each restaurant’s secret recipe of tomato and beer sauce, over french fries. It is every Porto man’s mission to have a favorite Francesinha spot and try all the new ones. We tried two different Francesinhas, one with an egg and sauce with slight vinegar tang (above), and another with more of a spicy kick (below). Both were delicious. So full and satisfied from the Francesinha, we took a 40-minute nap in the park under the sun before venturing onto our next destination, Matosinhos, by tram. Matosinhos is the fishing port on the far northwest end of Porto where you can find the freshest seafood restaurants and the sculpture “She Changes” by artist Janet Echelman. 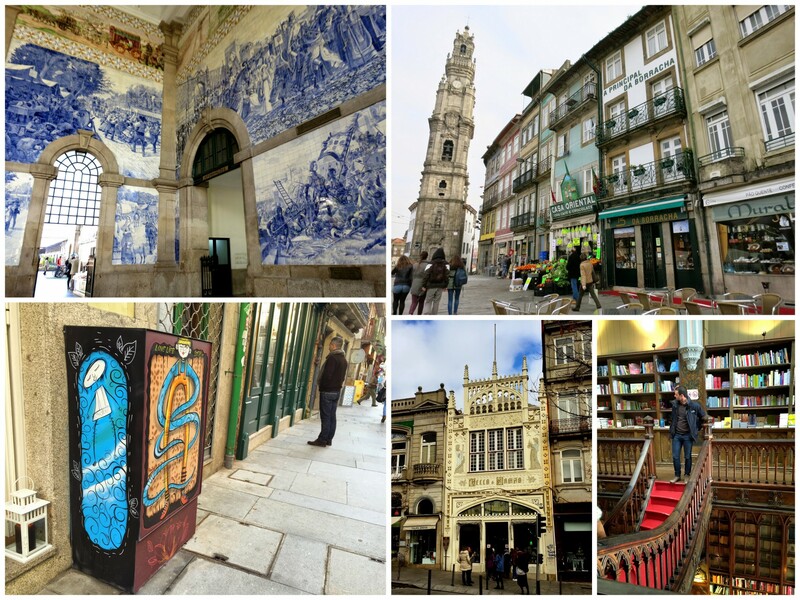 We signed up for a free city walking tour (tips based) that covered the entire old town in one afternoon and learned the rich history of Porto that we would’ve otherwise never have known. From how Portugal became independent, the creation and process of brewing Port, the best overlook, the tower built before the invention of lighthouses, the street artist loved by the people, and why the mural tiles are painted with only blue. That’s all the ones I can remember, and there was definitely a lot more. Clockwise: The tiles in the Saõ Bento train station. Tower had used as a guide before there was a lighthouse. The world renowned bookstore. The beloved street artist commissioned by the residents. In the afternoon, we worked our way across the Rio Douro for Port tasting and tour at Taylor’s. One may question the legitimacy and authenticity of the maker with none Portuguese name, yet ironically, those are often the most reputable brewers because many are family-owned, passed down for generation back when Port was created specifically to be shipped to England. Our walking guide recommended only two brewers who she considers authentic — Taylor’s and Croft. At 20% abv, good Port wine is smooth and dangerous! At the end of the day, we wished we had allocated one more day at Porto. We thought the town wasn’t too big and two days would be plenty, but on the contrary, it is one of those towns with layers of character waiting to be discovered.